Who says 10 minutes isn't enough to get a great workout in? Certainly not science. And while I wouldn't suggest you rely solely on 10-minute routines, they're perfect when the rest of your schedule implodes and all your pre-determined plans go out the window. I mean, really, 10 minutes is always better than no minutes, and there's not a person in this world who can legitimately say they can't squeeze a 10-minute workout into their day. Junius Morgan, NASM-certified personal trainer and owner of Unlimited Fitness NYC, points out that the best quickie workout is often the most convenient one. "My clients are largely New Yorkers and they mostly live in apartment buildings, so the time-crunch workout I recommend for them is to spend 10 minutes running up and down three flights of the staircase in their building." Not only is stair-running excellent cardio, it's also an equipment-free option that requires nothing more than access to a stairwell. Akin to stair-running, jumping rope is a simple, fast, and effective option, perfect for working parents like Alexandra Sampson, the owner of Mommy Track Fitness and an ACE-certified group fitness instructor. "My staple for a 10-minute-or-less workout is jumping rope. It's one of the simplest, most effective time-saving cardio and muscle-toning workouts around. In just 10 minutes you can burn roughly 100 calories while strengthening the legs, glutes, abs, and arms. Plus, it's an easy accessory to pack for an on-the-go workout." All you need is a jump rope and a timer. Start with 30 seconds of jumping followed by 30 seconds of rest, repeating the interval for the full 10 minutes. As you get better, increase your work time while decreasing your rest time. So, for instance, you could do 45 seconds of work and 15 seconds of rest, or 50 seconds of work and 10 seconds of rest. 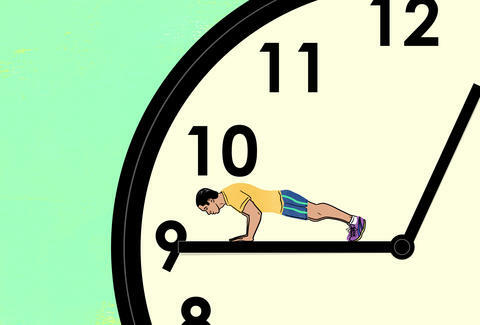 Just when you thought a 10-minute workout couldn't get any more grueling, it does. Brandon Mancine, an NASM-certified Corrective Exercise Specialist and CrossFit L2 coach, turns to metcon (that's metabolic conditioning for you lay people out there) or circuit training when he's pressed for time. "These workouts have been shown very effective for combating body fat and supporting a healthy metabolism when paired with proper nutrition." One such workout? Burpees. All burpees. Thank you, Brandon, for the most brutal 10-minute workout ever. Here's the deal: don't just do burpees until you pass out. 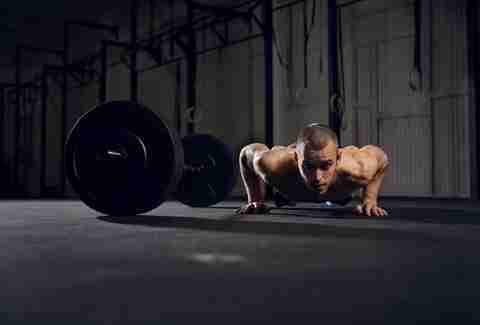 Cycle between 60 seconds of burpees and 60 seconds of rest for the full 10 minutes. That's "only" five minutes of work, but you're pretty much guaranteed to be a sweaty mess by the end. You'll continuously cycle through kettlebell swings, goblet squats, and push-ups for the full 10 minutes. You'll start by performing each exercise for 10 repetitions, then you'll reduce the number of reps for each circuit, so the second circuit you'll perform nine reps of each exercise, then eight, then seven, and so forth, all the way down to a single repetition. See how many circuits you can perform in 10 minutes' time. Chair pose: Stand with your feet hip-width apart and extend your arms forward. Rock your weight into your heels and bend your knees as if you're sitting in a chair. Just when you think you're at your max, lower your glutes another inch. Breathe deeply as you hold this position for 30-60 seconds. Rise up and continue to the single-leg chair. Single-leg chair: As with the chair pose above, lower your booty down into the traditional pose and pause. Lift your right foot 1in off the ground and hold for 15 seconds. Release the right foot and repeat immediately on the left side. Do this four times on each leg. Forearm plank: From chair, place your hands on the floor and walk yourself out to a high push-up position before lowering yourself onto your forearms. Stack your shoulders over your elbows, press your palms into the floor, and pull your belly in and up. Hold for 30-60 seconds, remembering to breathe. You can make it harder by lifting your right foot off the floor for a five count, followed by the left foot. Work your way up to 10 "toe lifts" on each side. Dynamic locust: Release onto your belly after your forearm plank and take a breath. Extend your arms long by your sides, palms face down. On an inhale, lift everything off the ground -- your feet, legs, chest, and arms. Exhale and sweep your arms out in front of you, Superman-style. Pause for a breath and return your arms to your sides. Keep your palms face down and don't let your arms rest on the floor. Repeat this motion 10 times before releasing. Side plank: From your belly, press up to a high-plank position. Place your right hand on the ground at your midline, directly under your breastbone, before rocking onto the outer edge of your right foot, lifting your left arm to the sky. Hold this pose for 10 to 20 seconds before switching sides. Perform the move to each side two times. Laura Williams is an exercise physiologist and fitness writer who plans to do the reverse-pyramid workout tonight. She'll report back on Twitter: @girlsgonesporty.